TRANSGRESSION, INTRUSION, COASTAL ABRASION, COSMIC PHOTOGRAPHS, GREENHOUSE EFFECT, TECTONICS. Slow rise of the world ocean level today has caused the development of a global trend leading to the erosion of sea shores, including even those shores that recently have shown an active growth. Latvian seashores also belong to this type. When losing land every state is entailed with great losses. Serious anxiety is also brought about by the speed of sea transgression. What is it like? Is it going to be relatively slow or catastrophic? What natural and anthropogenic processes are the causes for raising the level of the world ocean today? It is very important for any seaside country to know and be aware of what parts of its shores would become flooded and what are the specific local features of the sea transgression process for that particular coastal area. This article deals with the causes of the ocean level rise in the world and in Latvia today. The methodology of research and the phenomena supporting the development of sea transgression process have been described and the proposal for taking measures and reducing losses due to transgression have been presented. The total effect of natural forces and the influence of intensive economic activities of people have led to the rise of the world ocean level at present (E.Bird, 1985), (V.Gomitz, 1982), (P. Bruun, 1988), (H. Viles, 1989). Cosmic changes and cyclic pulsations of the Sun seem to be the main causes for millennial fluctuations of the world ocean level and climatic changes. (A.D Verneker, 1989). Considerable climate and ocean level fluctuations have been adapted to the millennial cycles of the solar activity. Thus, for example, the latest eleven thousand year-old-cycle that began in the glacial period, in 2000 will end with a transition period leading to a warmer climate. Shorter (two thousand year old) cycles have also been accompanied by consecutive changes of climate (Fig. 1). The change of the solar activity cycles leads to climatic changes not only on the Earth, but it also breaks into the functioning processes of biosphere and endogenic processes on the Earth, thereby increasing the tectonic activities of the lithosphere. For some regions of the Earth the variations of tectonics of the lithospheric plates are the second cause of the sea transgression. Thus, the two processes have been summed up: the process of the total rise of the world ocean level and the rise or sinking of the lithospheric plates. So, for example, the data of long-term investigations beginning with the middle of the 19th century in Sweden and Norway testify about a slow rise of the Scandinavian peninsula. The German scientist Pleifer was the first to mention that the changes of the Swedish coastline are brought about by the rise of land, whereas Leopold von Buch wrote in 1807 that "ocean equilibrium does not permit the fall of its water level. Since the fact about the rising coastline level in Sweden is indisputable, there is nothing else to be said but to state that Sweden is slowly rising". (M. Neumaier, 1900). 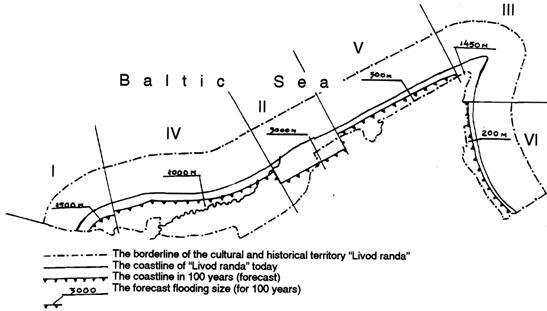 At the same time the scientists mention the sinking of the coastal zone of Latvia and state their viewpoint that the phenomenon of the sea transgression on the Latvian coastline has been caused by tectonic reasons. (A. Schlaupe, 1981), (E. Romanov, 1991). The part of the Earth's crust on which Sweden, the Baltic Sea and Latvia have been placed, undergoes the rhythm of the solar activity cycles and like swings, makes regular vibrational movements. 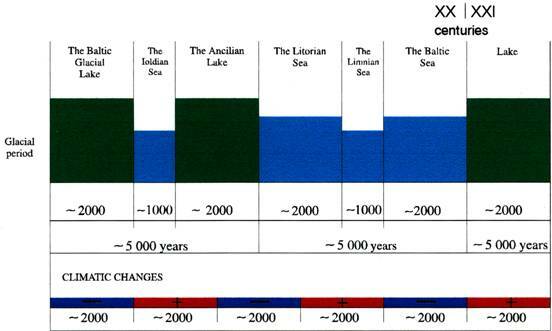 Every 5 to 6 thousand years the change of the lake and sea stages of the Baltic Sea takes place (I. Veinbergs, 1986), (I. Veinbergs, 1979) (Fig. 2.). At present the rising of Scandinavia, the sinking of Latvian coastline and transformation of the Baltic Sea into a lake are taking place and that all will end up in the period of 100 to 150 years. Total warming up of the climate due to heating up of the lower layers of atmosphere which is caused by the greenhouse effect may be mentioned as the third essential cause for sea transgression today (W. Brocker, 1987). For any state the sea transgression involves big material losses. Due to this a necessity arises to make a forecast of the speed of the sea transgression for specific coastlines. – the analysis of the coastline dynamics based on the materials of cosmic photography during the period of 20 years (1971-1991). The retrospective analysis of the paleogeographical situations in the region "Livod randa" has shown that the ekzogenic processes have reached their utmost power in the area of Cape Ovishi and the mouth of the river Irbe. A retrospective analysis of aerocosmic photomaterials covering the period between 1971 and 1991 was made to find the tendencies of changes of the coastline "Livod randa". The author of the analysis used "the line of intersection of (crossing) the water and the surface of the land" as a basis for the geomorphological determination of the coastline (Technical notice... 1989). Cosmic photographs taken in the infrared range of 0.7-1-1.1 mkm, and the spectral photographs taken in the range of 700-850 nm allowed to use them for making a precise model of the coastline in real time and presented 20 pictures of the coastline. A phototransformer and stereomeasuring equipment made by Carl Zeiss Jena were used for preliminary processing of cosmic pictures, which were later transformed on hard basis in the scale of 1:100 000. The analysis of all the information obtained during the processing and thematic interpretation of cosmic pictures of the area "Livod randa" during the period of 20 years has shown considerable differences in transgression and retreat of the coastline. These quantities are closely linked with the neotectonic build-ups of the coast - the zones of flexure and fracture disturbances. The intersection areas of regional zones of flexure and fracture disturbances with the coastline are characterized by the biggest quantities of transgression (up to 30m a year). The coastal areas located between the flexure and fracture disturbances are marked by smaller quantities of transgression (1 to 10 m a year). Comparison of the results of structural interpretation, paleo-geographical analysis and monitoring of the coastline shows that array of figures of the retreat of the coastline today is comparable with the parameters of the past lake stage of the Baltic Sea (in the period of Ancilian lake). The data obtained made it possible to draw up a forecast scheme of the state of the coastline in 100 years. In accordance with this scheme a considerable part of the coast territory may be covered by water (Fig. 3). Catastrophic situations may occur in the nearest future that would be caused by big water masses during the storms and it makes the coastal territories up to 500 m wide unsuitable and dangerous for people to live. The cosmic photography of the Latvian coastline which was made during the investigations of the coast "Livod randa" showed that a new cycle of sea transgression would be slightly different from the previous one. The eastern part of Vidzeme seaside of Latvia will not be subjected to flooding and submersion. (Fig.4.). The process of sea transgression on land is hyperbolic. Up to now it has been progressing very slowly, however, already today we may point out several phenomena testifying that this process is developing. Abrasion of the Baltic coast is increasing and bogging-up of the coastal areas is taking place. There are facts recorded testifying the intrusion of salt water into fresh water horizons especially in the areas of cones of influence. Fresh water salinity has also increased. Practically the flow of drifts bringing sand and gravel to the coasts of Latvia has stopped. The sand deposits have shrunk and the dolomite deposits have been exposed in the coastal areas of the shelf. It is partially linked with the sinking of Sambia peninsula that has been feeding Latvian coasts before. The Baltic Sea is gradually transforming and its waters have become fresher. The itchyfauna and the benthos are also changing and it has been proved by research done by Latvian, Lithuanian and Estonian scientists. Pine forests are subjected to some temperature discomfort as they need a cooler climate for their growth. In Finland, a northern country where pines grow, the scientists have reported about a more frequent blooming of pines. Since the process of warning-up leading to sea transgression depends on two causes, namely, natural and proantropogenic ones, two programmes are needed taking into consideration the specific features of every cause. The natural factors do not depend on the community good will. The factors may be studied and sometimes forecast in order to bring the inevitable losses of material and human resources to a minimum. The sooner the governments begin to practically react and face the oncoming transgression, the smaller the losses that the states could suffer from will be. The greenhouse effect is the product of nature mismanagement. The community is capable of taking a number of measures to weaken the process. And this is of utmost importance. We should not concentrate only on natural phenomena that are unpredictable and complicated enough. Investigating the influence of the greenhouse effect on the state of the atmosphere attention should not be only focussed on that factor. We must not forget that the main conductor of the opera "Sea Transgression" are the natural cosmic causes. 1. Bird E.C.F Coastline changes: a global review. - Brisbane. 1985.-192 p.p. 2. Brocker W.C. Unpleasant surprises in the greenhouse? Nature, 1987, Vol. 328. Nr 6126 P. 123-126. 3. Bruun P. - Sea level rise, as a cause of shore erosion. - Journ of the Waterways and Harbours Division. 1988. (WWI) P.117 -130. 4. Eberwards I. Our sea shores and global climatic changes. Diena, December 12, 1991 (in Latvia). 5. Neimair M. History of the Earth. 1900, p.434 (in Russian). 6. 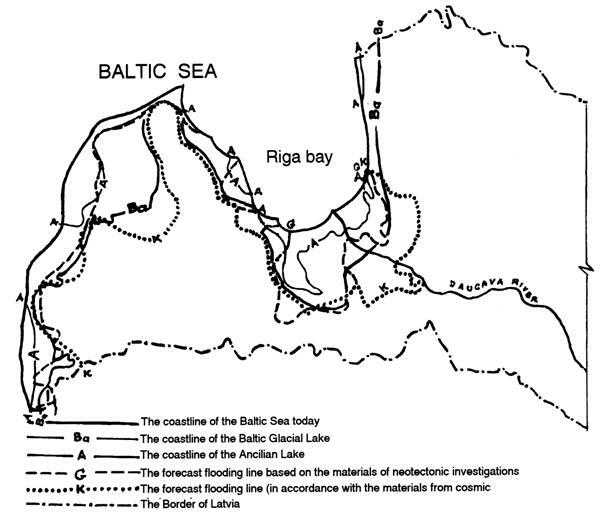 Romanov E. A. Reconstruction of the paleooceanic conditions of internal sea in the quartenary times ( on the basis of the Baltic Sea), M., 1998. Thesis for Candidate's Degree of Geographical Sciences (in Russian). 9. Schlaupa A. I., Berzina I. E., Kaiak K. F., Straume J. A.. "Neotectonic map of the Soviet Baltic republics Scale 1:500000. 10. Ulst V. J. Influence of natural and antropogenic factors while increasing the local wash - outs of the Latvian shores in the Baltic and the resort of Jurmala. Motivation of the principles of shore protection, Riga, 1990 (in Russian). 11. Veinberqs J. Ancient shores of Soviet Baltics and other seas of the USSR, Riga, Zinatne, 1986 (in Russian). 12. Veinberqs J. The quaternary history of Baltic Latvia. 14. Verneker A. D. Long - period global variations of incoming solar radiation (Meteorol., Monographs. Boston. 1972). 15. Viles H. A. The greenhouse effect, sealevel rise and coastal geomorphology. -" Progr. Phys.Geogr.1989. 13. N3. p.452 - 461.